NPC’s like Biblionef are under immense pressure to become self-sustainable. It is important that the organisation does not become solely reliant on Donors whose criteria may change and who are affected by global economic trends. The need for Biblionef to carry out its mission is as critical as it has ever been, with many children’s organisations relying on Biblionef for a donation of mother tongue books. Therefore, Biblionef offers its expertise in library skills to literacy organisations that have funding. Biblionef has been very successful in rendering services such as the covering of books, setting up libraries and sourcing appropriate books for particular age-groups. Literacy organisations can also use their funds with Biblionef to carry out their projects. 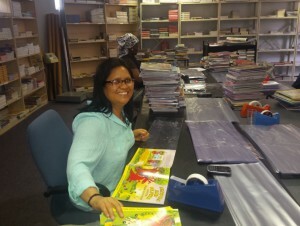 Biblionef hires unemployed women to cover the books in plastic. 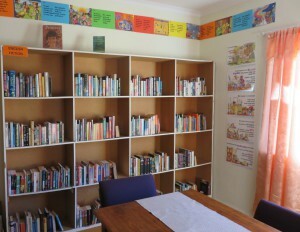 A library setup by Biblionef at a children’s home.